It is mid June already. Solstice is less than a week away and the skies are still light late into the evening. I know there is rhythm to the patterns of the seasons, but it always seems to me that the longest day of the year should come in mid summer and not while I am still trying to feel summer is coming. Even in our forest, where sunrises and sunsets are obscured by the huge firs that surround us, the light lingers. I remember my days living in North Idaho, when the skies would be light after ten pm and I would rise with the sun and the birds at 4:30 in the morning. Sometimes I miss that, those incredibly long days, but I really don’t miss the winter dark at all. Speaking of light, we have honored the solstice month of June with light. As mentioned before, we live in the forest, and in addition, the house has long wide porches. I love the porches, but they do limit the light coming into the house. We started the project last year, ordering special heavy snow load, no leak skylights, but by the time they were delivered, the weather had turned and our contractor thought better of opening up the roof to the skies during winter. I was getting impatient with the wait. Somehow as spring progresses and the sun moves higher into the sky, we get even less light in the house than in winter when it is low on the horizon. In winter, we also get reflection from the snow that makes the house brighter. As spring progressed, everything just seemed to get darker and darker. Until finally, Peter showed up with the windows and his happy crew to install our skylights. Peter is one crazy guy. I know contractors can be an eccentric bunch, but Peter was especially so. Still, he did a great job, got it done on time, and kept us entertained in the process. He was the proud poppa of a new baby and wasn’t getting much sleep. The nice thing about Peter was that he actually worked right alongside his crew throughout the project. It is wonderful to have light in the house, somehow it just changes everything. Jeremy loves to sleep on the carpet in the brilliant beams. That warm sunlight is good for his achy old bones, I am sure. Of course, with all that gorgeous light, it became obvious that we needed a good carpet cleaning. I called some company called Blue Heron in Klamath that uses a dry cleaning method involving organic materials made from corncobs. He did a great job, with barely any dampness to the carpet at all, so now everything feels really fresh and nice. We were looking around today and talking about just how incredibly busy we have been. I guess June is always like that, and if you throw in a second house to think about, it just gets a little bit crazy. We spent some time at the cottage, after Mo had an arborist take down the two most dangerous trees that were hanging over the roof. I am sure some of those oaks must be at least 100 years old. The madrones are probably not as old, but they seem to lose their tops with age, so I suppose more tree work is in our future. I counted more than 20 trees on that .89 acre Grants Pass property. Love that shade, though. Right after we got back from our camping excursion, Dan and Chere (Mo’s brother and his wife) brought their motor home to the cottage for a long weekend visit. Mo and Dan spent the entire time working with wiring, eliminating some of the most glaring problems, and figuring out what was what with the breakers. It IS an old house, and for some reason almost everything was hooked up to just one circuit. Dan and Mo are a great working team, and Chere and I spent a lot of time watching them run back and forth with a mission. Then part of the time Chere and I just went to town to check out the Old Town section of Grants Pass, buy goodies at the Saturday Farmer’s Market, and do a little shopping. I found a pair of Oofos, and after reading Sherry’s rave about them, decided to get a pair. What luxury. It is kind of like falling into one of those Memory Foam beds, only for your feet. Luscious. After all the hard work, we went to dinner at the wonderful Taprock Grill and watched the beautiful Rogue River sliding by on what felt like a very summery evening. Of course, we had picnic lunches out under the trees, and big breakfasts to share. It was a nice time spent with family and we got a lot done. I spent a long time dealing with a weed in the field that is on the noxious weed list for Oregon. We will see how that goes. I took some hand quilting and knitting with me, but I haven’t had my sewing machine out for more than six weeks now. Mo thinks summer isn’t quilting time. Gardening has been big on the list as well, at both places. After being in Grants Pass with our limited water, I love so much coming home to Rocky Point and our deep, cold, fabulous well with unlimited water. Here I can hose down driveways and run sprinklers as long as I want to. Funny though, I keep catching myself thinking I need to turn off the hose. Oops, nope, I am not in Grants Pass where I have to make sure the hose trickles at 2.0 gallons per minute. I test it with a bucket, and that way I can run the hose all day to water the fruit trees and shrubs without running the well dry. Then of course, there is kayaking. I am sad to say that today was the first time we have had our boats out this year. But oh what a perfect day it was. We were on the water by 9am, early enough that it was still cool and the birds were out in force. We decided to go south into Pelican Bay, and then back north through the marsh on Crystal Creek, crossing the Wocus Cut back to Recreation Creek and back south to the Rocky Point boat launch. Crystal Creek was thick with birds today, especially the terns, which must have been breeding with the black tipped orange bills and all the ruckus they made as we passed. It was fun to watch them dive for fish. I saw a beautiful great egret, a couple of blue herons, American white pelicans, some kind of hawk, and even a turkey buzzard, a bird I don’t often see soaring over the lake. Red wing blackbirds were everywhere, and I am pretty sure I saw a tri-color blackbird as well. The surprise was a night heron flying right in front of my boat, low over the water to disappear in the tules. The weather was perfect, and the stiff breeze coming from the south made paddling against the current in Crystal Creek a bit easier, and wasn’t hard enough to slow us down when we were traveling with the current on Recreation Creek. Crossing the Wocus Cut is always beautiful, and this time of year the water was deep enough to make the crossing easy. There are canoe trail signs to mark the route, because it is easy to get lost in the refuge when the tules are high. On the northern horizon are the peaks of the Crater Lake Rim, to the west is Mt McLoughlin, to the east, the expanse of Klamath Lake, and to the south the beautiful, still snow covered Mountain Lakes Wilderness. We have been just so busy this spring, and when the weather would break, it seems we were always doing something else. Out there on the water I was reminded of why I should just drop whatever I am doing and get out in the boat more often. What a treasure we have right here in our back yard. Of course, I took my camera with me. I do have a Pelican waterproof case, but I usually hang the camera around my neck while paddling so I can get photos of the birds. I also had my cell phone with me so I could play with the MotionGPS app that tracks our route. Coming into the landing, I decided to put the camera back in the case and took off my life vest (where the cell phone was located) before exiting the kayak. Does anyone remember my little video from last year about how easy it is to exit a kayak? Well I am glad I wasn’t taking a video today, and I am especially glad that I had taken off my vest and stowed the camera. Today I managed to dump myself right into the lake as I was trying to get out of the kayak. The very cold lake! Luckily we live less than a mile from the launch, and when we got home I dumped my very shivering self right into the hot tub in the bright afternoon sunshine! I was warmed up in no time! Speaking of back yard, we are planning some summer camping trips to take advantage of our choice to stay around home this season. After the fourth of July we will go camping at our favorite little lake just south of the state line, Medicine Lake. I think the last time we were there was in 2009 before I moved back here from California. A short trip to Lapine and the famous Sisters quilt show will be extended by camping up at East Paulina Lake south of Bend. In August we hope to get back over to the beautiful Oregon Coast and try out a new campground that we always drive past and never actually camp. Harris Beach is so wonderful, but it is time to give some of the other coastal campgrounds a try. Then right after Labor Day when the heat dissipates a bit, we will head for John Day country, Joseph, and Wallowa Lake. I spent some time fiddling around with the blog, attempting to use a new template. It seems that my old template (borrowed from Laurie of Semi-True Tales) is out of date and won’t allow me to add the Google plus buttons at the bottom of a post. I thought it would be nice to have that, since I do use Google Plus, but some long time honored readers didn’t think much of my new plan. No one else said much, but if one person was disturbed, I suppose others might have been as well. Besides, it was really bugging me that I no longer had that nifty “stretch” feature I inherited from Laurie, and that I couldn’t get the header photo to be in the center of the page. I backed up the old blog template before changing, and it was a simple matter to just reload the old template. So no Google plus buttons. I also tried to shift to the new Google plus comments, but that was a fiasco as well, since anyone who isn’t a member of Google plus could no longer comment. Like Erin, I dumped that one as well. Hopefully with all the Google changes, everything will still work. I do really enjoy reading Rick’s updates on what Google is doing, and how to deal with the little stuff that comes up now and then. Every single time I have asked Rick a question, he has responded almost immediately and unselfishly with help and advice. They charge big bucks for that, you know, and Rick just pops in and answers detailed complicated questions for so many of us. In my spare time, (yeah right!) I decided to get down to the real planning for our winter trip. As usual, after Christmas this year, we will travel south to our favorite little desert haunts, Joshua Tree, Desert Hot Springs, and Anza Borrego. This time, however, we are just going to keep going and travel east and south for at least three months. I am having to plan a bit more in advance than I might like because we will be in Florida in February, busiest time for some of the places we want to go. It is hard to try to figure out exactly where we will be on an exact date in order to make some kind of reservations. But I am trying. 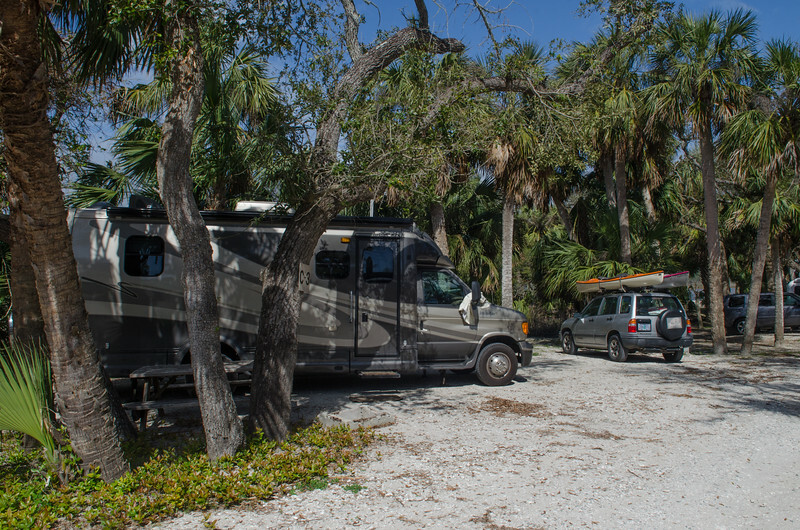 I have been pinning and saving all sorts of campground, kayaking, and sightseeing information from some of my favorite southern bloggers including Sherry and David, Karen and Al, Randy and Pam, TravelBug Susan, and lots of other blogs. No, we didn’t start in the middle of the creek, that is just when I turned on the MotionGPX app. We hope to be in Big Bend National Park in Texas by mid January. Although I read several blogs that talked about visiting Big Bend, I didn’t keep track of who was there when. If you happen to read this blog, and you happened to have posted about your visit to Big Bend, could you drop a note or comment and let me know where to look for those posts on your blog? I have tons of stuff of everything from South Padre Island east to Key West and back north into Georgia. We have traveled south to Tucson and Bisbee and east to Las Cruces, so those are knowns. I even traveled across I-10 with my daughter last year, and Mo and I looked longingly south toward Big Bend on our very first trip in the MoHo after we bought her in New Braunfels. But Big Bend? Nada. You know who you are, send me a note, please? Oh yeah, in the midst of lying around eating bonbons, I decided that I needed to refinish my dining table. I am just doing the top, thank goodness, because the rest is fine. Sometimes I can be really stupid, and last year when learning to quilt, I used some spray fabric adhesive without protecting the table properly. Wouldn’t you know it, it took the finish right off! Ugly and yes, very stupid. So I bought a can of Formby’s, some steel wool, some oak stain, and some polyurethane and tackled that project this week. By the time company arrives on the 24th, I’ll have a very smooth, very shiny, very new looking table top. It is actually kind of fun seeing the transformation, and so far it is looking really good. Stuff comes in threes, and my third stupid move for the week was freaking out with Jeremy. Now Jeremy is very old, 17 years, and he has been a perfect cat for all those years. Until recently. Now sometimes he gets confused and forgets where his box is. Gah. Thank goodness at least he doesn’t spray or urinate. But still, I saw him in a familiar pose on the newly cleaned carpet and picked him up and put him out on the porch. Jeremy is an indoor cat, and he is also very arthritic. Within minutes he was gone like a shot, and we had no clue where he was hiding. I felt really bad, and Mo and I walked the area for a couple of hours calling him. Finally, just as it was getting dark, he came up to the porch. He was pretty quiet and very slow, and was completely saturated with dark brown heavy dirt. Who knows what hole he found to hide in. The rest of the evening he was quiet and stayed under the bed. I woke up at 5 this morning thinking I had probably killed my cat and was scared to look under the bed for him since he never came up to sleep with me as usual. But no, my very dirty cat was in the living room waiting for Mo to build a fire. The mornings are still cold enough for a fire here, and once the hearth was heated I dunked Jeremy in a warm bath and tried to get the worst of the dirt out of his fur. My gorgeous, sleek, 13 pound perfect cat has become a very skinny crippled up 7 pound old man. He can still see and still hear, although not as well as before, but his life most of the time seems good. Most of the time he is happy, but sometimes when he gets quiet and sleeps all day and doesn’t move around a lot, and when I see him stumble when his back end doesn’t work properly my heart knows that he won’t be around for long. Like so many of us, I may have to make that choice someday if I see he is hurting too much, or if his eyes tell me it is time. I certainly don’t want him to disappear into the forest and get eaten by a coyote because I have put him out on the porch in a fit of frustration! Geez!